Yangus is a character from the game Dragon Quest VIII and a playable character in both Itadaki Street DS and Fortune Street. Yangus is from a poor town named Pickham. Originally a bandit, he eventually tried to live cleanly, but turned back to his life of thievery until recruited into the player's party. 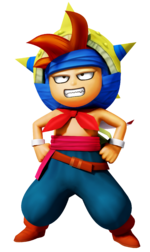 Yangus appears as one of the eleven playable Dragon Quest series characters in the Mario and Dragon Quest cross-over game Itadaki Street DS. His design is based on his child design from Dragon Quest: Young Yangus and the Mysterious Dungeon, rather than his adult design from Dragon Quest VIII. Yangus' Hat and Yangus' Clothings are collectable items that can be equipped on customizable characters. Yangus returns as a playable character in the sequel Fortune Street. His appearance is almost the same as in Itadaki Street DS; barring minor touch-ups. He has a rank of D, but Yangus makes better choices and moves compared to the other D-rank characters. North American Official Site Bio: "A hoodlum from the sticky-fingered town of Pickham who aims to be a master thief. He's liable to pull a fast one if you face off with him." This page was last edited on February 16, 2019, at 22:54.